Considered one of the finest blossom trees available, Prunus 'Shogetsu' also goes by the names Prunus Shimidsu and Blushing Bride. The name Blushing Bride perfectly describes the delicate looking, large, blousy double flowers that hang down in big bunches from April-May, opening pink and fading to bright white as the season progresses. It is also a very popular choice to give as a wedding gift. The shape is typical of a Japanese Flowering Cherry tree, elegantly spreading and growing to approximately 4 x 6 metres in 20 years. Not only does Prunus 'Shogetsu' look impressive in the Spring, but Autumn brings a splendid display of orange and red colour. 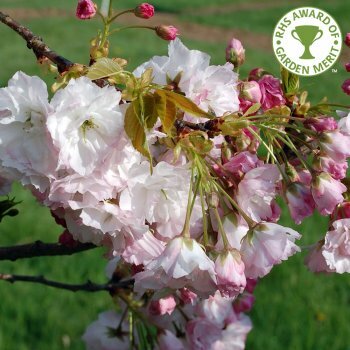 This popular Japanese Cherry tree is suited to all except wet or shallow chalky soils and being pollution tolerant, is ideal for urban planting. Our pot grown Blushing Bride Flowering Cherry trees can be planted at any time of the year. Choosing a location away from strong winds protects the blossom display. Start by removing weeds and grass within a metre of your desired planting hole. Dig a square hole as deep as your root mass and approximately 1.5x as wide. To help the tree establish more effectively, sprinkle root grow in the hole. Remove the pot, gently loosen the roots and place into the planting hole. Mix 50% of the original soil with 50% compost, fill in the hole and firm around gently. Avoid banking the soil up around the collar of the tree. We recommend planting Blushing Bride Cherry trees (except multi-stem forms) with a stake and tie kit to ensure the roots are well anchored - instructions are in the planting guide. Although it is possible to leave your Blushing Bride Flowering Cherry tree to its own devices, if you prune it for the first few years it will create a more balanced branch framework. Prune after flowering i.e. after the petals have dropped but before the new shoot growth appears.